BumBet is the betting site for those who love to bet! 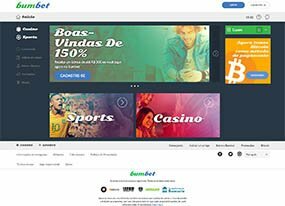 Based in Brazil, BumBet is making a name for themselves in the online sports betting market. With a fantastic betting interface, wide variety of betting options, and their casino gaming options, it's hard to ignore BumBet. There are plenty of opportunities for sports bettors to place a sports wager on Bumbet, who cover over 31 sports including football, basketball, volleyball and tennis; with live betting options for most. Just how many events does BumBet cover? Approximately 700 leagues, tournaments, contests and tournaments worldwide. Among the sports covered, popular options are: NFL, UEFA Champions League, Europa League, Bundesliga, Brazilian Championship and many more. BumBet’s live betting platform runs 24 hours a day, with over 15,000 events per month, including 350 betting types across 18 different sports. BumBet has great bonus options available for customers, including a first deposit bonus a 50% of deposits up to R$150. The bonus must be turned over at least seven times before any withdrawal can be made. The bonus must also be turned over within 30 days to qualify. They also have the opportunity to use combination bets (or parlay bets as they’re commonly referred as) to earn up to 20% more when you combine five or more bets into one larger bet. All five selections must have odds above 1.50, and all bets must win to succeed. Their website is clean, easy to navigate and has a fantastic live betting structure. There are some great betting types and options available for each sport available, along with competitive odds. Making a deposit at BumBet is quite simple and straight forward – they have plenty of deposit options available to choose from. Neteller, Boleto, AstroPay and Bank transfers are all common deposit options at BumBet. Bettors can easily withdrawal from BumBet using either Neteller or Bank Transfers. Need assistance? BumBet’s customer service is top notch. They have representatives ready to help 24 hours a day that can help you with any of your questions.